The German Tribes have invaded the Roman Empire because their traditional homelands can no longer provide adequate sustenance. 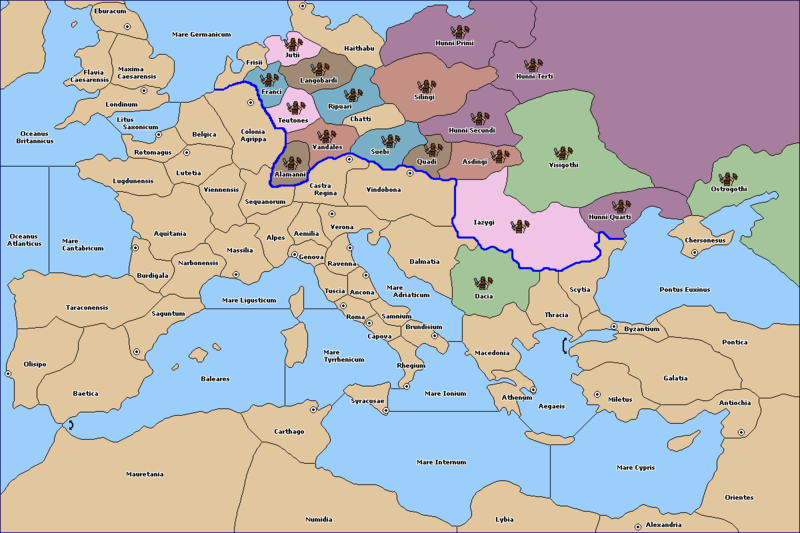 The lack of tribal resources described above is represented in this scenario by the presence of only two SCs outside of the Roman imperial borders. Furthermore, no unit starts at a SC. 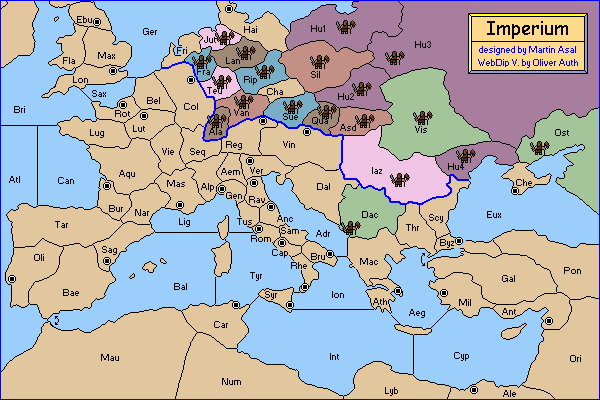 Only 9 SCs can be reached in the first year, which means that all nations will need to remove units at first. Be careful, or your game will finish fast! After the first year, everything is different: There are numerous SCs, many of them near each other. Can you afford to give them up to someone else? There are no home-SCs. In the Adjustments Phase, a unit may be built at any owned and open SC. Byzantium is adjacent to the Aegaeis and has a canal. The Rivers Rhenus and Danuvius serve as the borders of several areas. Thracia and Galatia are adjacent to each other, as are Baetica and Mauretania. While an ordinary move is counted with one plus supports, an army crossing a river is counted with one force less. Support crossing a river can't be given if the target zone is on the other side, and crossing a river doesn't cut a support. Retreats orders can't be done over a river. These borders are ordinary borders for fleets. Fleets aren't able to move inside the continent.